Conquistadors brought the tomato home from their New World adventures, but it was not until the 18th century that the fruit was commonly eaten in Spain. Bread with tomato–a simple dish of toasted bread rubbed with fresh garlic and ripe tomato pulp, and drizzled with olive oil and sprinkled with salt–took a century to go mainstream. A visitor sampling pan con tomate (or in Catalunya, pa amb tomaquet) for the first time might be forgiven for asking “What took you so long?” It’s that good. 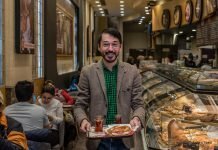 Whenever we visit a city that is new to us, Tom and I always welcome an opportunity for a culinary tour and a chance to orient ourselves to local food customs. 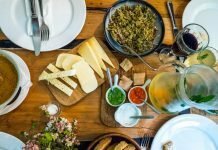 On our recent cruise along the Spanish coast, our yacht docked in Andalusia, and we couldn’t wait to explore the local food scene with Devour Malaga. Happily, when we tucked into our first nibble of the day, it was pan con tomate, and we knew we were off to a good start. We met our guide Susana and a small band of culinary food explorers at historic Plaza de la Constitución for a mid-day walk through the city center. Along the way, we learned about historic places and architecture, the city’s love of festivals, and admired Roman ruins. Our day was punctuated in the most delicious way possible, with stops for breakfast, snacks, wine and a tapas meal with dessert. 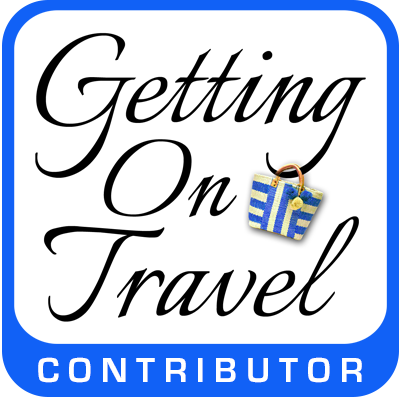 What a fun way to explore any city, but especially vivacious Malaga! Malaga almonds are in a class of their own! Just 20 families have a lock on selling them, dressed with olive oil and salt. 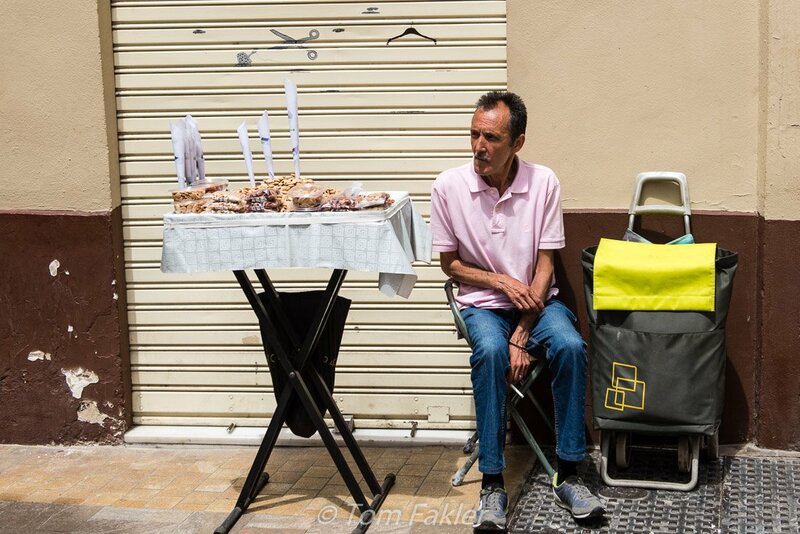 A do-not-miss street treat, while taking in the sights. 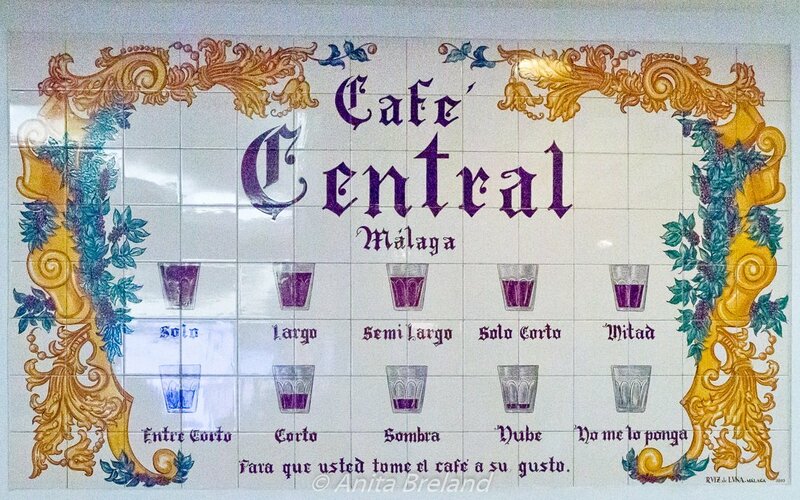 Our first stop was for a savory-and-sweet breakfast, where we learned ten ways to order coffee in Malaga, based on milk preference. I chose a largo (mostly coffee) and Tom ordered a no me lo ponga (don’t bring me coffee, give me something else). 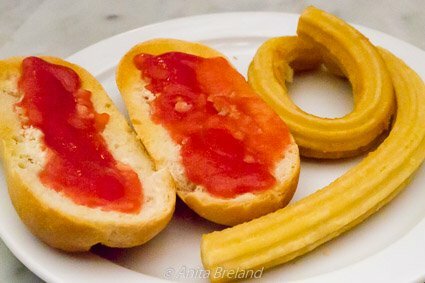 Introductions and conversation took place over pan con tomate and churros, Malaga-style. I could start most any day just like this! Coffee ten ways: only coffee, no coffee and everything in between. 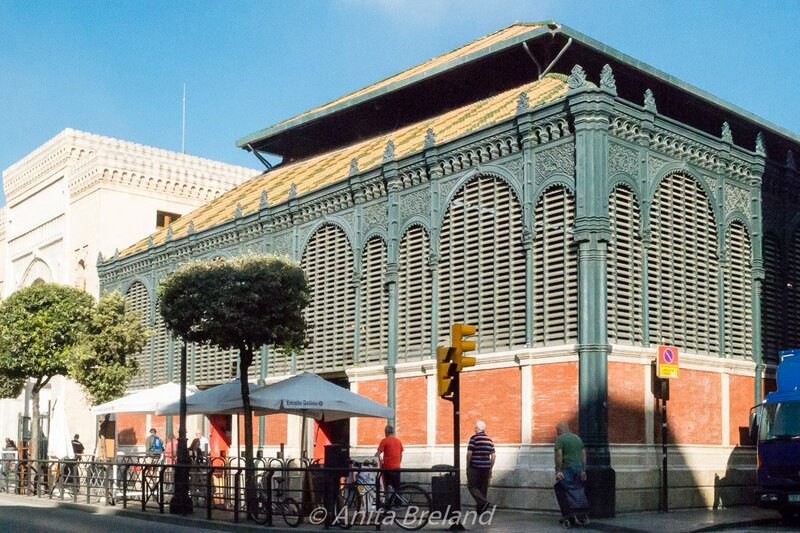 Malaga’s Atarazanas Market is in a 19th century building faced with iron slats, arched windows and panels evoking Arabic style that honors the single remaining arch from the original structure. The venue has done a ripping business for centuries, through a number of transformations. First built as a shipyard (atarazanas in Arabic) when the sea lapped along its south wall, the building served as a convent under the Catholic Kings in the 15th century. It housed an armory, a hospital, and medical school before architect Joaquin Rucoba designed the spacious market we visit today. Fish, meat, cheese, and fruit and vegetables in the market are all fantastically fresh. Several vendors delighted our group with tastings of their specialties: olives, juicy sun-dried moscatel raisins and sweet garlic. 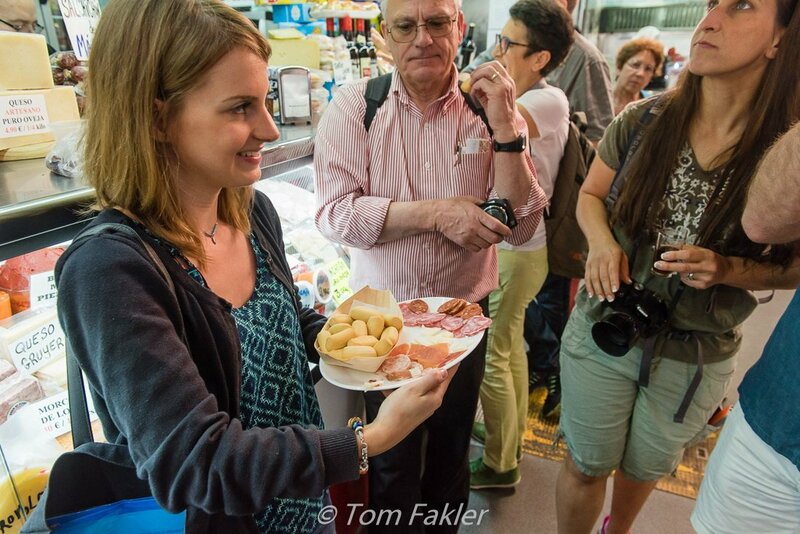 When that was done, we sampled an array of Spanish hams, cheeses and a little glass of Moscatel wine. 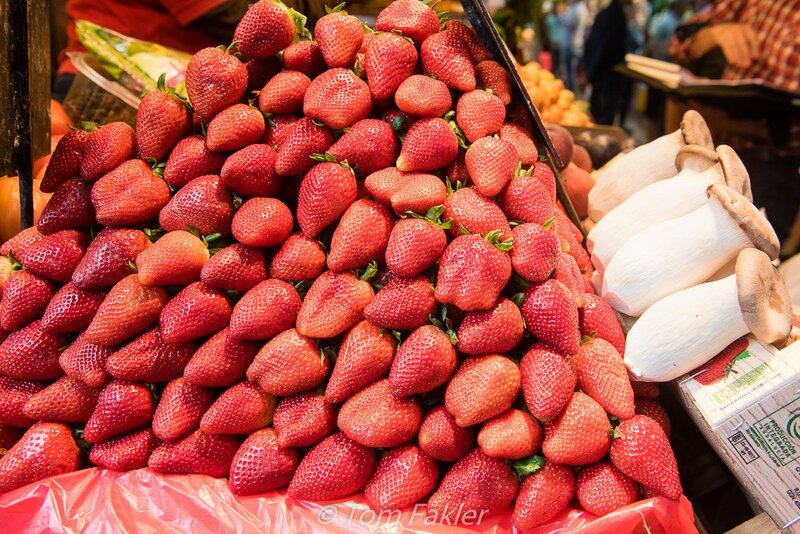 Fresh fruits and veggies in the Malaga market: irresistible freshness and quality. After tasting sun-dried moscatel raisins in the market, it was time for the fermented version at another market stall just around the corner. Later, at a wine shop a few steps out of the old quarter, we tasted wines from regional producers. Our host at Mainake Vinos & Gourmet regaled us with local history as we enjoyed a selection of his wines. 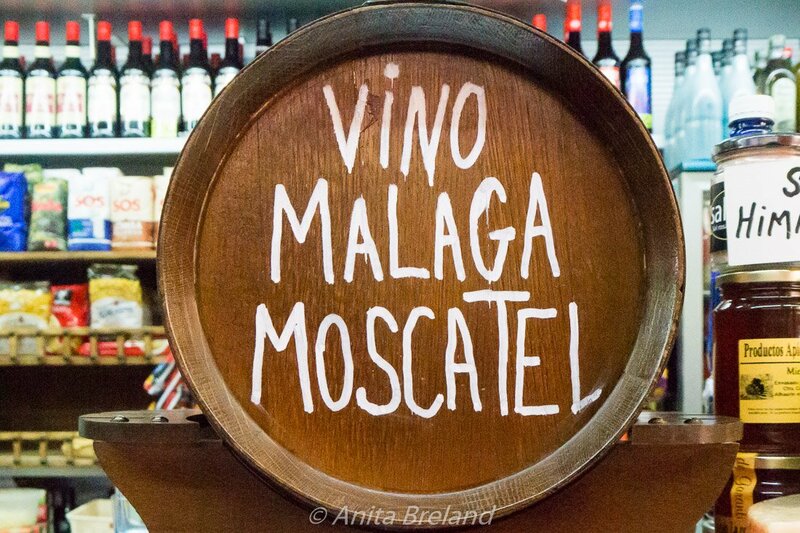 Malaga Moscatel wine in the farmer’s market: perfect accompaniment to local cured meats and cheeses. When it comes to tapas, every part of Spain has its own specialties. In Malaga, that can mean plate after yummy plate of fish, meats and veggies done up several ways. 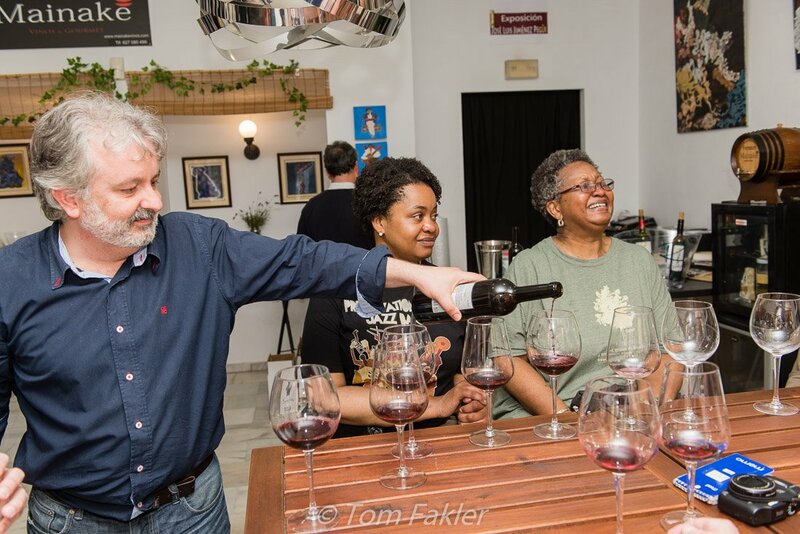 By the time we made our way into one of Malaga’s most delightful tapas bars, our group felt like family. And so, we gathered around a table family-style, much as we might at home. Everything was done to a turn. Tuna Moroccan style, reminded me of one of my favorite tagines. Anchovies were fried to non-oily perfection. Meatballs came in a delectable almond sauce. Dessert was an impressive leche frito (fried condensed milk, sprinkled with cinnamon and served with hazelnut ice cream). A local style wine cooler was especially refreshing accompaniment to our tapas meal. 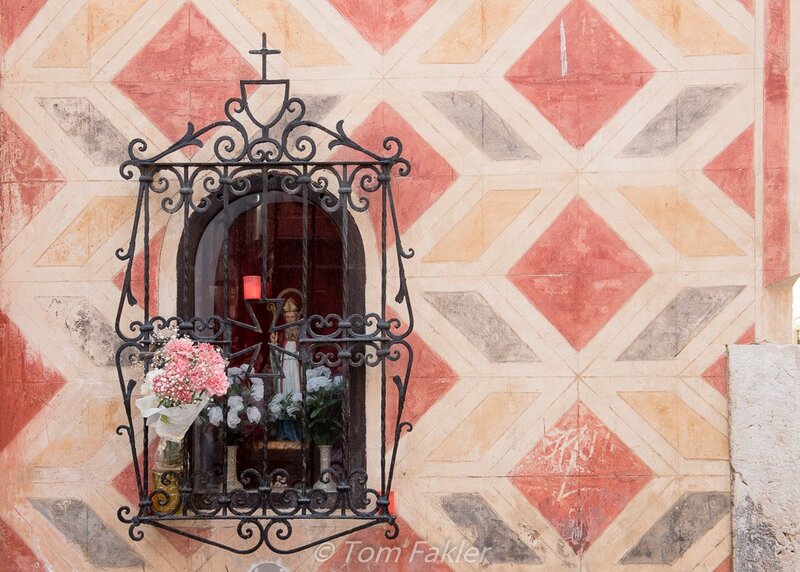 As we toured Malaga, we also had a glimpse into the city’s period architecture. Churches, sculpture, and Roman ruins–all put in an appearance on our walk, adding color and historical anecdotes to the walk. I loved that our stop at a Roman ruin turned culinary, as we looked down into a thousand-year-old garum pit, where fish were fermented into the famous condiment so popular across the empire. Garum was an economic mainstay for Roman Malaga, as well as the soy sauce or ketchup of its day. The fishy paste has recently been brought back to life by Spanish researchers, but we did not have time to seek out and try the modern version. Next time! This church, with its Moorish facade, is the parish church of the actor and native son, Antonio Banderas. 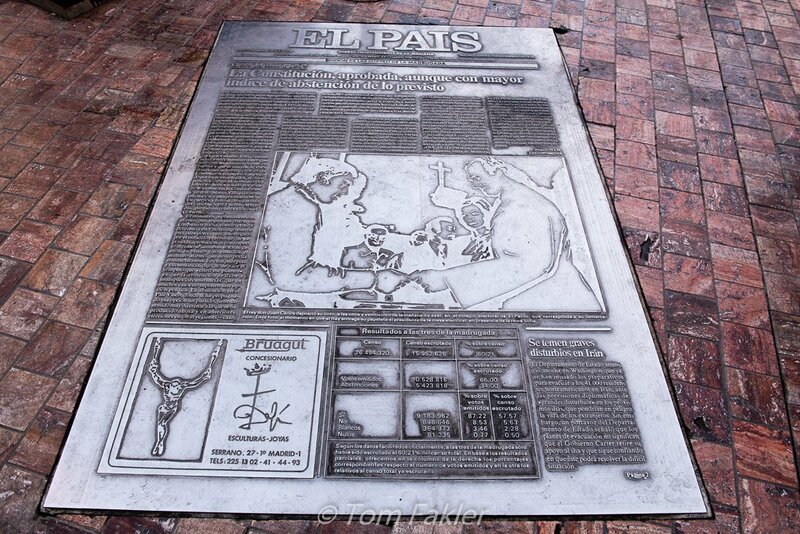 Malageños are proud of their majority vote for the Spanish constitution following the Spanish Civil War, an enthusiasm commemorated in plaques on display in the center of town. 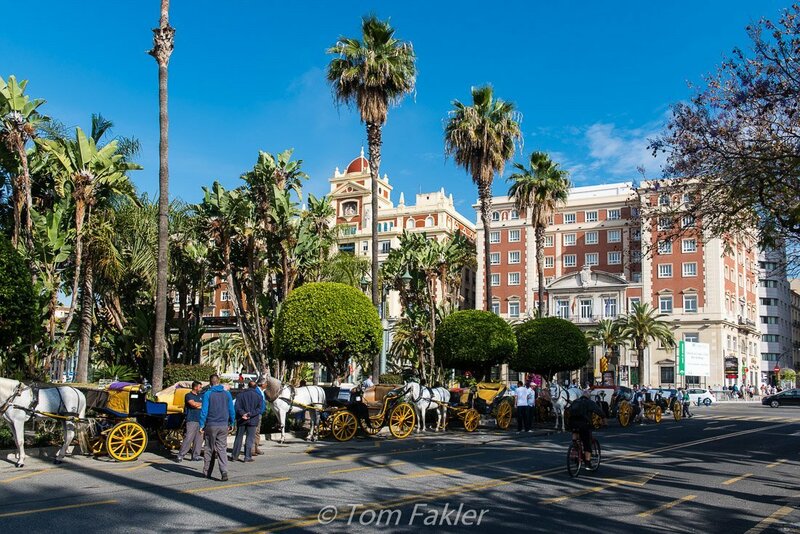 Horse-drawn carriages await visitors under blue skies and palm trees. 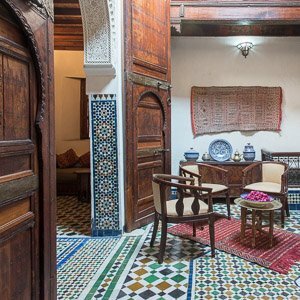 There is nothing like walking with history and taste buds, exploring with a local guide with a passion for place, food and people. Ours was one of the first for Devour Malaga, and we were delighted to find that Susana knows her adopted city well. She is an enthusiastic, energetic and empathetic guide. Bring sunscreen. Malaga is blessed with sunshine, and the walk offers ample opportunity to soak up a bit of it. Here is one source to for temperatures, rainfall and sunshine to expect when you visit. Come on the walk prepared to eat! If our tour was any indication, you cannot go wrong with the Devour Spain series. 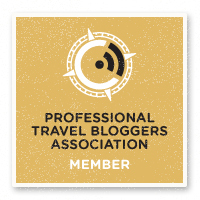 Headed for Barcelona, Madrid, or Seville? 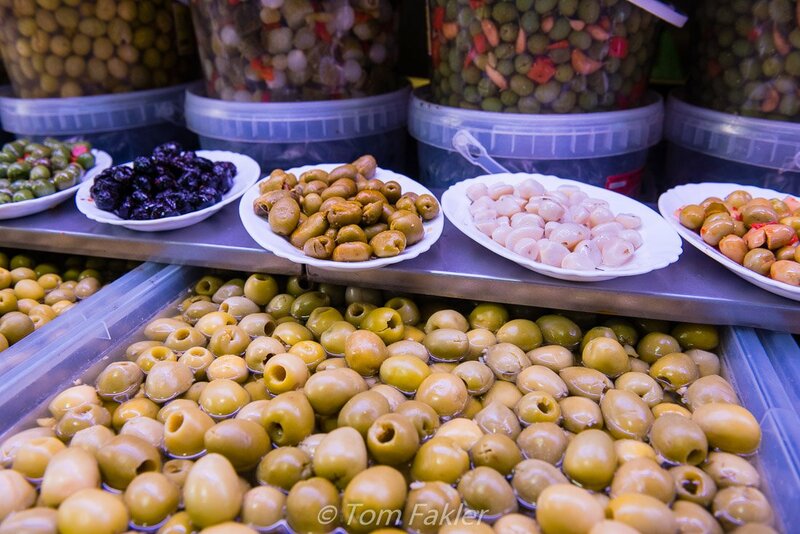 Take a tour to get your taste buds acclimated to Spain’s regional foods. Keep an open mind, and sample everything you are offered, even just a bite. You may find a fabulous new flavor you never expected. There is plenty to see and do in Malaga. Tickets to Museo Picasso Málaga can be bought online, and Malaga is home to the best preserved Moorish citadel in Spain, the Alcazaba. Visit Malaga tourism’s website for more about these and other must-see attractions in the region. 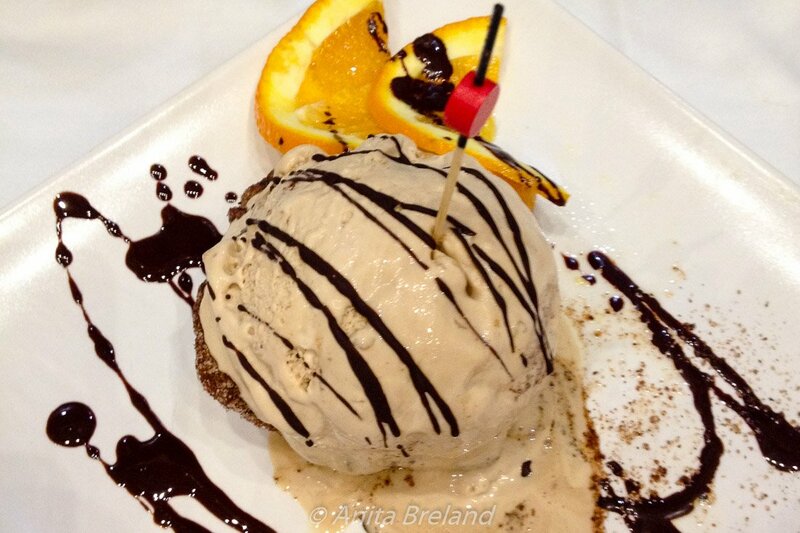 Thank you Devour Malaga for our delicious introduction to Andalusia…We loved every minute! Through this wonderful description, i fully recognize my preferred vacation place. thanks Anita & Tom. Ha! 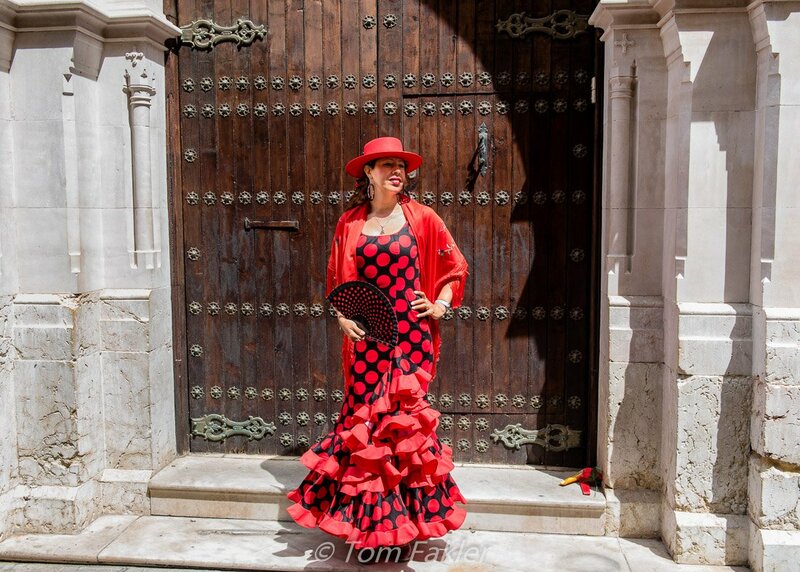 So glad you approve, Lahcen…Malaga was definitely one of our favorite stops along the Spanish coast. We need to go back for a closer look. Great Place. The food is cheap? 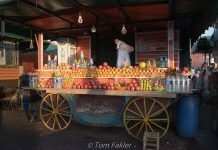 Our food walk did not reflect the full menu of any one restaurant, but rather the interesting local traditions featured at each stop along the way. Malaga offers excellent dining options at all price points!